Activities this week focused on the off grid solar electricity systems here. Sometimes, you just need a little bit more energy – especially over winter. You’d think that a shop selling high technology solar electric equipment would be like walking into a mad scientist’s workshop where there are all sorts of unexplained high technology looking items hanging around, perhaps a few computer displays providing readouts for who knows what. However, the shop that I have been frequenting for a few years now is actually run by a bunch of lovely hippies – who are all very helpful! The hippies look like they’ve spent the weekend blockading forest roads from miners and loggers or possibly they were just in an inner city park fire twirling and playing the bongo drums. However, they really know their solar stuff and are pleasant to deal with. This week, I’ve installed three new solar panels. Solar electricity is great, however, I am not connected to the electricity grid and have no desire to rely on a fossil fuel powered generator. Therefore, I have to be able to reliably produce enough solar electricity from the panels under the very worst weather conditions. These worst conditions are usually found in the depths of winter. If the system itself does not produce enough solar electricity, it simply shuts down. The shutdown occurs to protect the batteries which would otherwise be permanently damaged if they were completely depleted. Plus, it would be hard to explain to my partner why the hair drier – not to mention the lights – don’t work on a cold winter’s morning! The first new panel was installed on the shed for the very small 12V (V refers to Volt) off grid solar electric system which powers the shed. A new 200W (W refers to Watts) solar panel replaced the existing much smaller 80W solar panel because the system simply did not produce enough solar energy during winter and the battery was starting to run low. The reason that it was running low was that my usage of electricity had exceeded the generation from the small solar panel. The original 80W solar panel will be re-used on the new shed once it has been constructed. I’ll include details in this blog about how an off grid solar electric system works when I get around to that project later in the year. It is good to have a small solar power system because one can run: lights; pump; grinder/sharpener; air compressor; and even a radio from it. Good stuff. The new solar panel for the small off grid system which powers this shed is on the very left hand side. 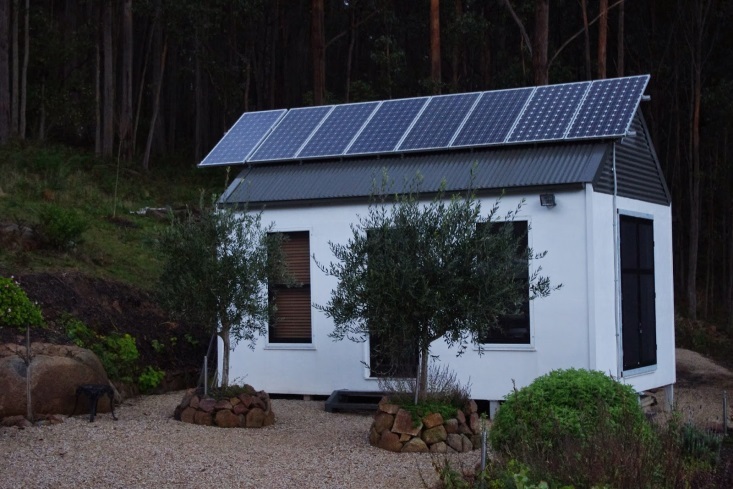 The remaining panels are connected to the much larger household off grid electric system. The other two new 190W solar panels were a “nice to have thing” for the households existing 24V off grid solar electric system. This much larger off grid system easily sailed through winter, however, it is always nice to have a little bit more generation potential just in case weather conditions deteriorate. As an interesting aside, during really cloudy days, a solar panel will only produce about 10% of its rated output. Also during winter the sun is much lower in the sky which means that the solar panels rarely produce their maximum output. Reading peoples Internet fantasy proposals for somehow powering future Industrial society to the level of current household expectations using solar power always makes me laugh. Summer, maybe. Autumn and spring, yeah well, not so much. Winter would be very unlikely. Still it would be nice if they tried. 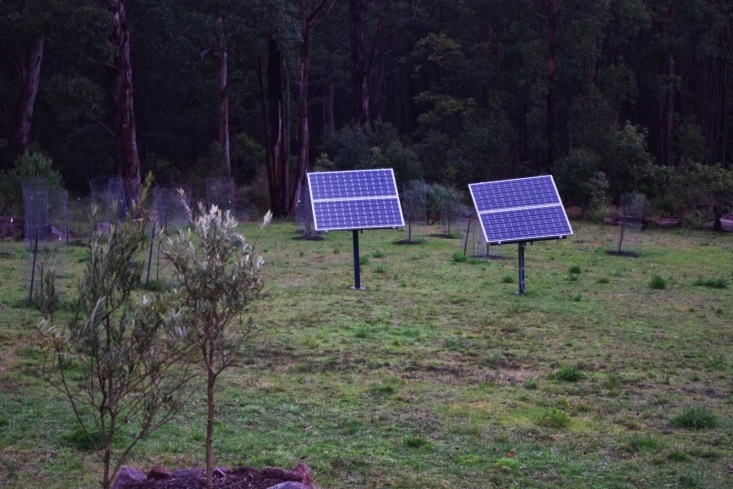 The free standing mount for the two new solar panels were made using scrap steel. All up it took about two full days of construction to construct and install the mount and both new solar panels. Working with steel is hard work as there is a lot of cutting and drilling. Steel is a very unforgiving material if you make an error. Someone once told me: “measure 5 times and cut once” and it was very good advice. The two new solar panels were installed next to some existing free standing solar panels. It hasn’t all been about solar this week though. I’ve also commenced construction of the fence for the new blackberry bed. The blackberries are thornless varieties (Chester and Waldo) which taste amazing. 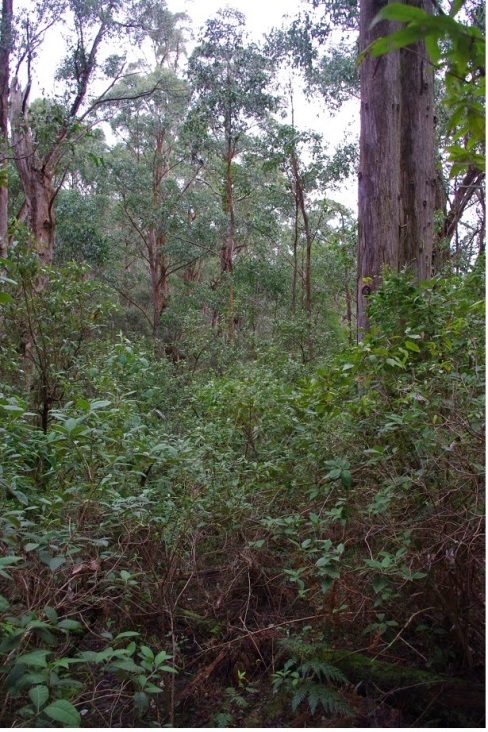 The area has to be fenced otherwise the local wallaby strips all of the leaves and fruit whilst possibly also breaking the canes. So far, two posts have been cemented into the ground with hopefully more going into the ground this week – weather permitting. Two posts for the new fenced blackberry bed. 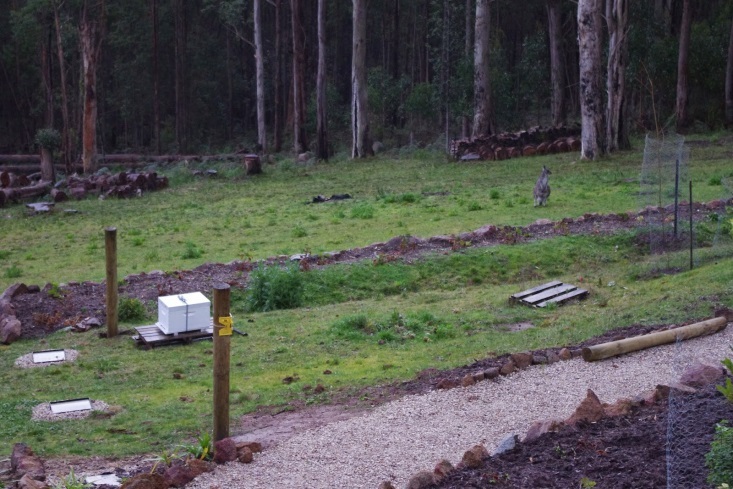 Note Kangaroo above the pallet in the picture. As an interesting aside in the photo there is a Kangaroo and although it is quite hard to see in the photo, she has a joey in her pouch. It is easy to spot the joeys because when mum leans over to eat some of the herbage, the joey sticks its head out of the pouch and takes a nibble too. Prior to this the joey consumes milk but once you can spot them, they will start to spend more and more time out of the pouch. 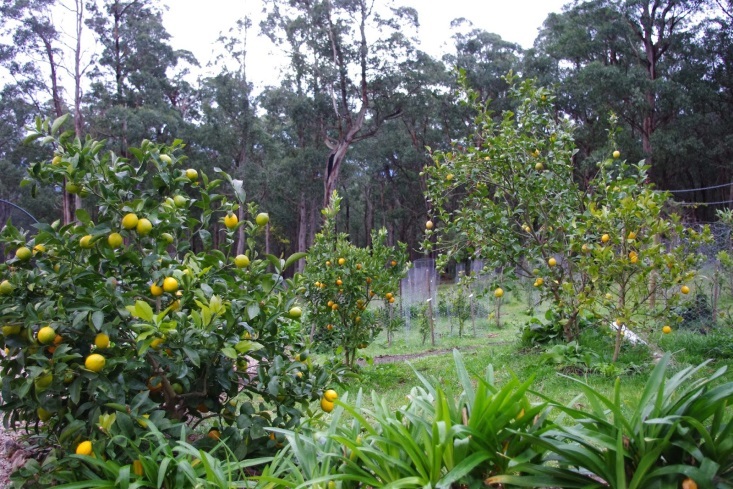 On the fruit front, I’m including a close up photo of some of the citrus trees here because winter and spring are the time here for fresh citrus fruit. The trees are prolific producers and if you can grow citrus in your area, I thoroughly recommend it. I have consumed and given away many dozens of these fruit already this year. Citrus trees during winter July 2014. Over the past week, I’ve also been thinking about how to describe the rainwater collection systems here. It occurred to me that it is simply too hard to describe in words, so the best way to talk about how the system works is to show a video of a small rainwater collection system which is in the chicken enclosure. The system in the house is very similar in principle only much bigger. The main difference between this system and the household system is the inclusion of a pump so that you can move water uphill, but in most other respects, it is the exact same system. I hope you enjoy the video and please feel free to ask questions. I’ll show the house water system next week and then introduce the farm plan. The temperature outside here at about 9pm is 7.1 degrees Celsius (44.8 F) and so far this year there has been 505.4mm (19.8 inches) of rainfall which is up from last week’s total of 495.4mm (19.5 inches). – which roughly translates into continuing wet weather with even a brief snow shower. That doesn’t mean that work stops at the farm here, even if the excavations for the new water tanks have had to be abandoned for the time being. 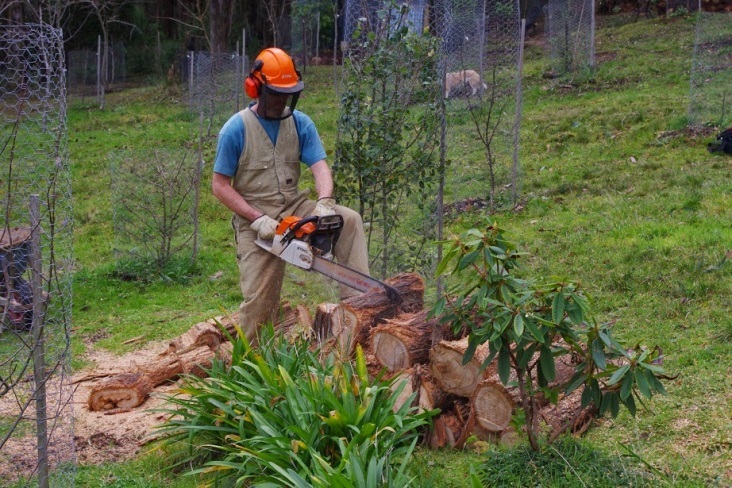 In the past few days the chicken enclosure had about 0.5 cubic metre (17.6 cubic feet) of deep litter removed. This material was then spread about the orchard. 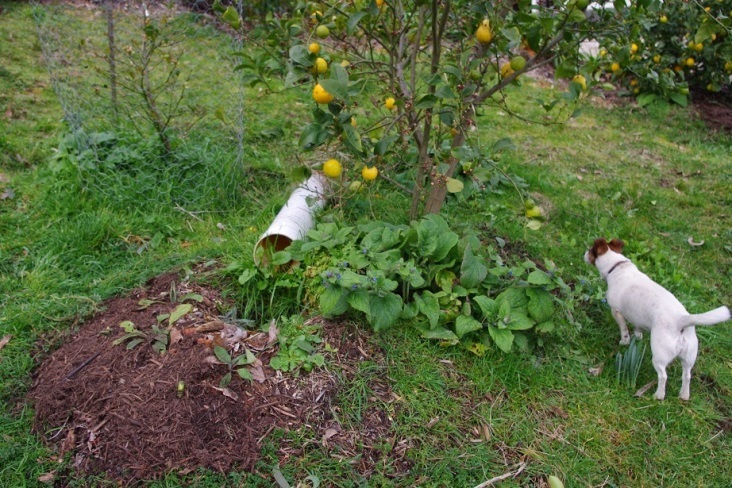 After that material was spread, a similar amount of clean composted woody mulch was placed into the chicken enclosure for the chooks to scratch around in. For those that know their soil stuff: composted woody mulch is high in carbon; and chicken manure is very high in nitrogen and phosphate. Add the two materials together, get the chickens to turn it over for a few weeks and you have a soil that you could grow almost anything in. 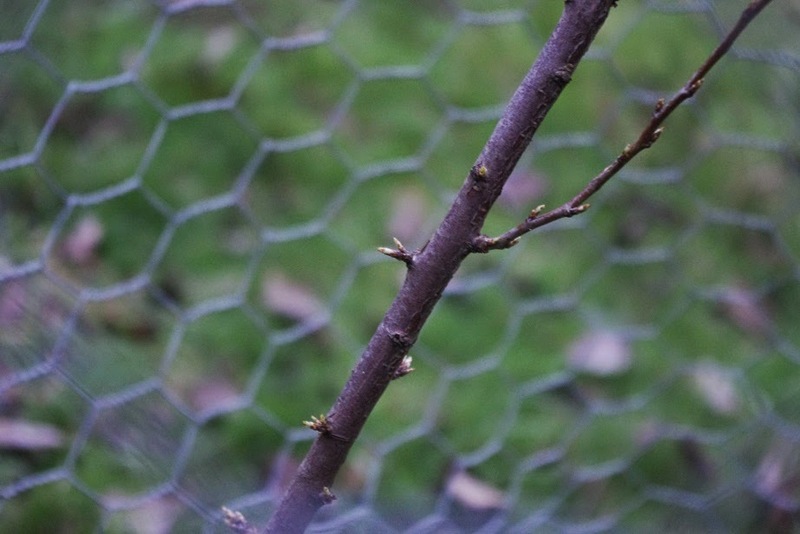 The added benefit to this system is that any grains that were uneaten by the chickens produce edible sprouts both before and after removal from the chicken enclosure. Wheat, Oats and Lucerne can turn up growing in the most unexpected locations in the orchard! The chicken enclosure and hen house were built many years ago and I made a bit of an error in the process. The error is that the chicken enclosure was built uphill of the hen house, when it should have been the other way around. It doesn’t sound like much of a problem, but the chickens scratch in the deep litter in their enclosure and in that process move the material downhill towards the hen house. 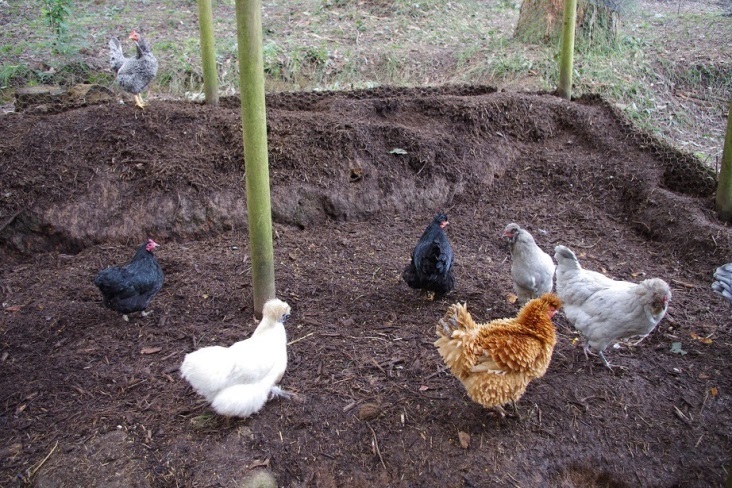 I then have to regularly move the deep litter material back uphill and away from the hen house. It does aerate that material though. I know when to remove the deep litter material from the chicken enclosure when it starts to look a bit sludgy and/or may also possibly produce a smell. Your nose is the best guide as to when to clean the chicken enclosure. Generally the hen house and the enclosure here have a reasonably neutral smell. 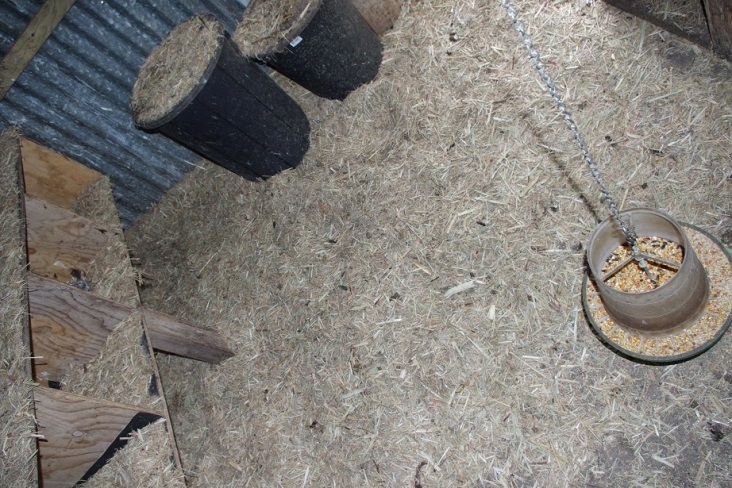 The dry used bedding for the chickens is spread onto the concrete floor of the hen house during the winter months and it gives the chooks something to scratch around in on cold wet, windy days when they’d prefer to be inside their hen house rather than outside in the enclosure. 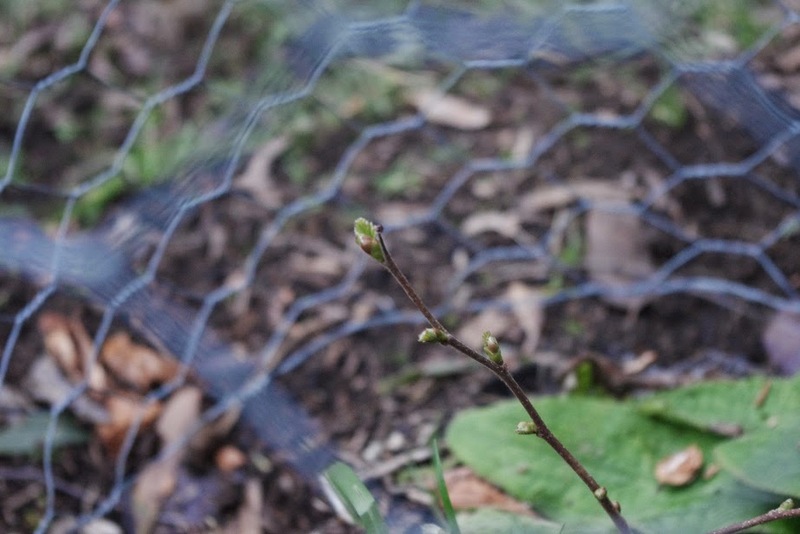 Last week I scored some – get these plants out of our sight – cheap strawberry runners and a new variety of hazelnut shrub. 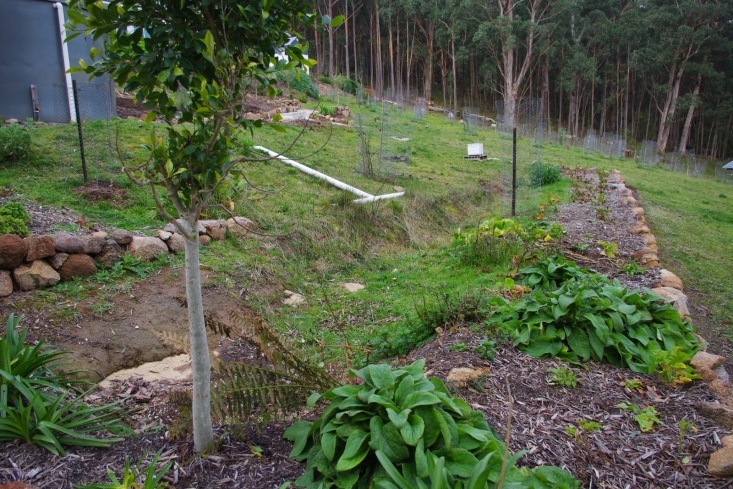 The remaining 0.5 cubic metre (17.6 cubic feet) of composted woody mulch brought onto the farm that wasn’t used in the chicken enclosure was used to establish the new strawberry bed and provide food for the hazelnut shrub. 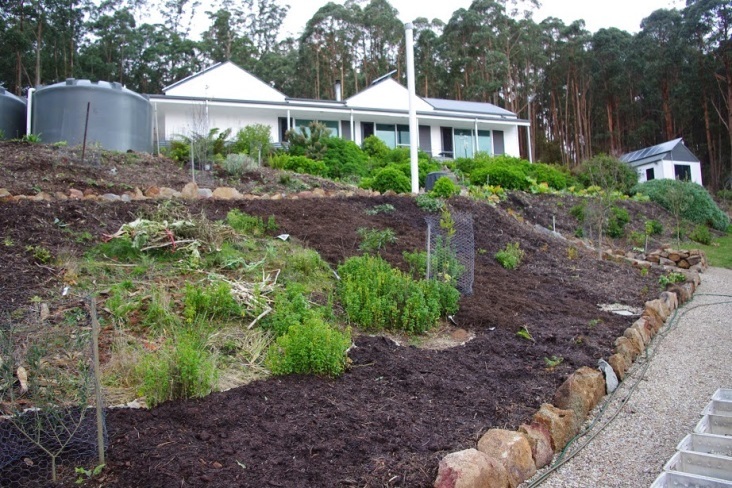 Generally I plant new trees directly into composted woody mulch mixed with the local clay/volcanic loam and it has worked well here for many years. I have no idea what this means for future seasons, but people I speak with further north than here are experiencing rainfall of up to half their normal average. (Remember that in the southern hemisphere heading north is the equivalent of heading south in the northern hemisphere). It is an impressive bit of engineering, but it doesn’t hold water. A local earth moving guy that worked during construction of the house here told me that he wouldn’t take my money to build a dam (pond) at this location because the soil did not hold water above the ground level. It was good advice and he was correct. Yet where does all of the rainfall here go? 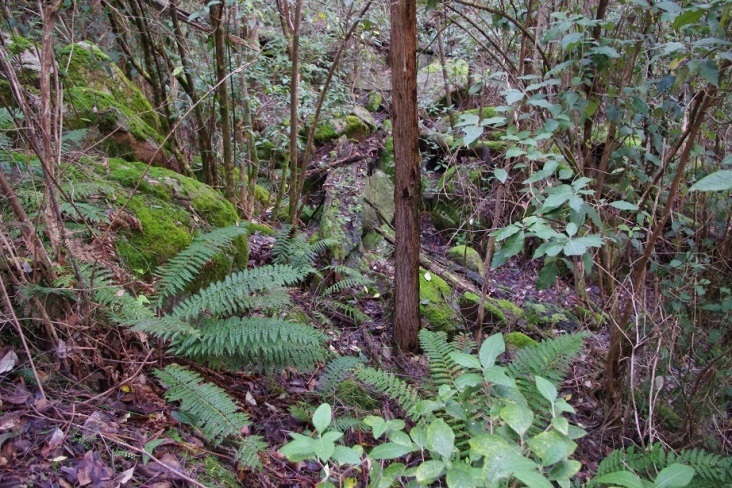 The simple answer is that it ends up in the ground water table at this elevation in the mountain range, only to reappear on the elevated plains below much later as a running creek which drains into the local river. Water does not flow through the ground quickly at all and it may take several years for water in the soil to move from one location to a distant area. Also, all trees require water in order to survive periods of drought, so the trick in these sorts of locations (and with most natural grasslands and forests) is to store as much rainwater in the ground water table as possible. Setting up systems on your farm to achieve this outcome is the simplest way to drought proof a farm. I may have mentioned before that I do not (or try not to) till the soil here. The reason for this is that the farm is located on the side of a hill and tilled soil tends to run downhill with the water during heavy rainfall. 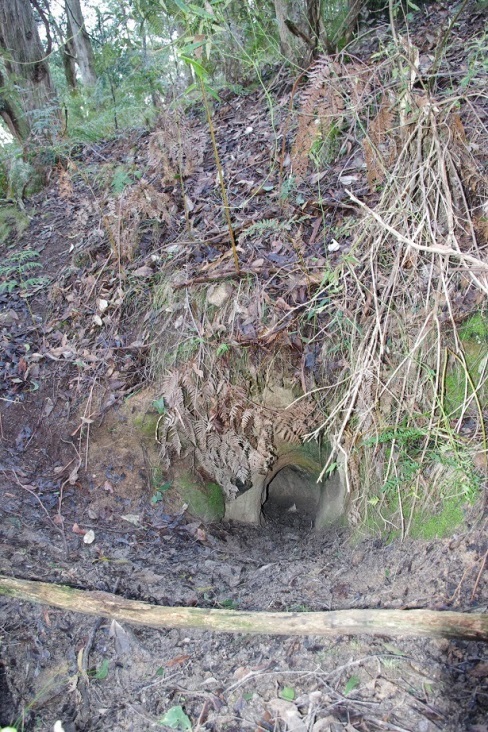 The root systems of the vegetation slow this erosion process. Also the other problem is that the sun here tends to kill the soil life where it has no plant material (dead or otherwise) to protect it from that solar radiation. When there is exposed or compacted (i.e. squashed) soil here, rainfall tends to run across it on the surface, whilst everywhere else rainfall infiltrates the soil. A good example of compacted soil here is a road. Rainfall will collect on the road and run along its surface. Say, you have 400m (437 yards) of road which is uphill of your farm. That road may also be about 5m (5.5 yards) wide. That equals a rainfall catchment area of 400m x 5m = 2,000 square metres (2,187 square yards). 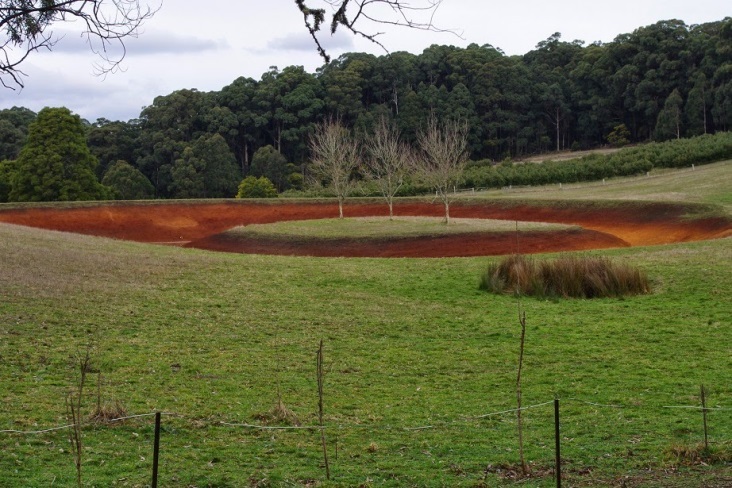 If you wanted, you could direct all of that rainfall catchment onto your farm. So for every 1mm (1/25 inch) of rainfall you could potentially collect 2,000 litres of water (528.3 gallons). Imagine how that quickly multiplies for every additional mm or inch of rain received! So how do you get all of that running water into the ground water table for later use over the summer? The answer is provided by the permaculturalists who are always banging on about swales. 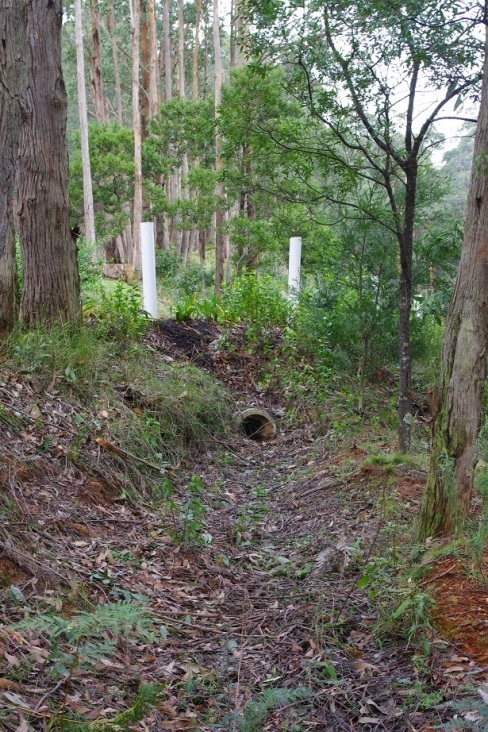 A swale is simply a leaky dam (pond) or drainage channel. Yes, it is that simple. 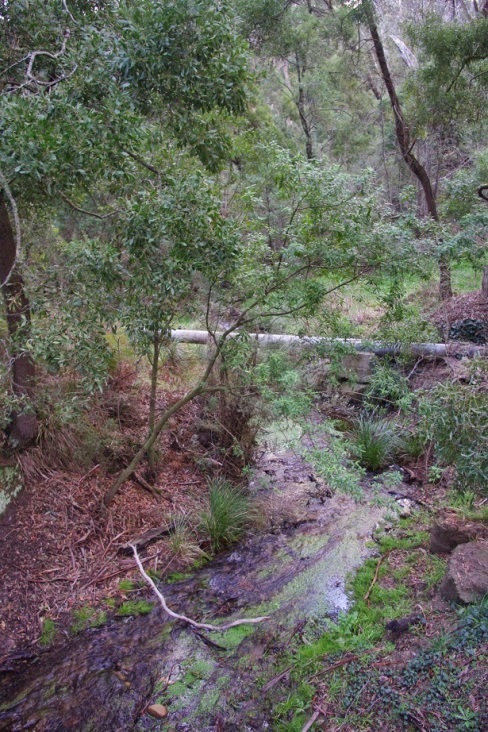 Put water into a leaky dam and it will slowly infiltrate into the ground water table. Given that once the water is in the ground water table it only moves very slowly across the landscape, it will hopefully be available for your more established deep rooted plants during the summer. Other than that, it will ensure that the ground water table that you use for your well is not being depleted through over extraction. This is exactly how a swamp works. It collects ground water and then recharges the ground water table. It is most unimpressive engineering, but simply works. As a fun fact, baby wombat uses that large pipe as a wombat highway and I often seen her climbing down into it at night. Next week, I’ll include the farm plan and you will be able to get a feel for where these different systems are installed. In breaking egg news (sorry, bad joke alert!) the chooks laid 4 eggs today! 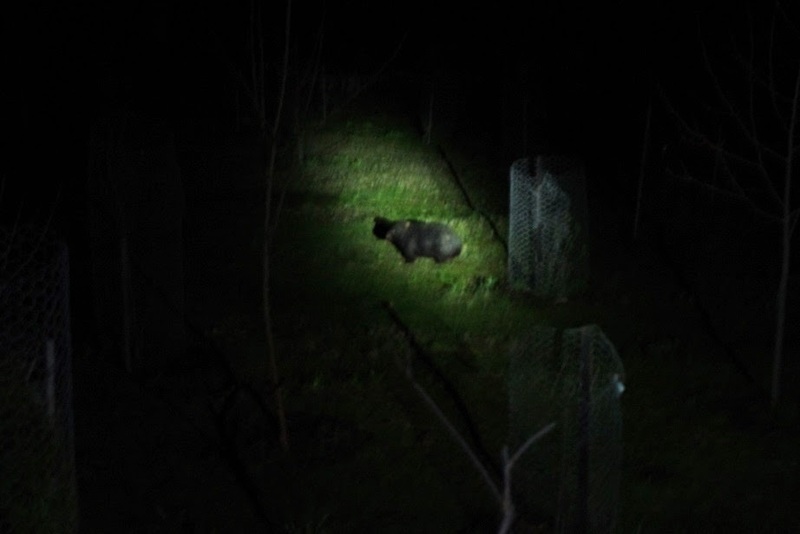 Also, I captured a photo the other night of Fatso the house wombat cruising the herbage. Enjoy! The temperature outside here at about 8pm is 3.5 degrees Celsius (38.3 F) and so far this year there has been 495.4mm (19.5 inches) of rainfall which is up from last week’s total of 474.6mm (18.7 inches). On the other hand the wind died off so I was able to haul, cut and split the fallen tree into useful chunks of firewood. You have to wait until the wind dies down because otherwise chunks of tree fall down and may possibly hit you in the head. Some of that new firewood is burning in the wood box at the moment and that heat is also being put to good use baking some banana muffins. Not only are the dogs currently cooking themselves on the hearth, but the house smells of fresh banana muffins too. Thanks, fallen tree! It was a bit of a slack tide this week however, the mixed flower, herb and vegetable garden received an extra 1m3 (35.3 cubic feet) of mulch and compost. Over the past few years I’ve been trialling various plants so as to test their overall hardiness in these conditions in all seasons. Last summer was a real shocker with 10 days above 40 degrees Celsius (104 F) and three of those were in a row with a peak of 44.5 degrees Celsius (112.1 F). Now that I’ve started to get a feel for what plants are working here and what aren’t, I’ve increased the area of those test beds. Since last summer, there are now steps, access paths, taps for water, rock retaining walls and deep mulch. It is a great system because those plants provide flowers for the insects, habitat for the frogs and reptiles, food for me, shade for the soil and shelter for the smaller birds which eat the predatory bugs off the main food crops. It is amazing how a small family of blue wrens can decimate the cabbage moth population. It is a complex system and gets more complex every year as the diversity of plants increases over time. Plus it just looks and smells nice. I’ve had a few requests to talk about water systems at the farm here. Water is a complex topic Down Under, so I’ve thought about it and decided to talk about the subject by telling a story and then over the following weeks talk about what I do here to adapt to the extreme local conditions. It is an important story, because there is no back-up plan here and if I run out of water, there are just no easy options. It is the future for all that exist on water sourced from somewhere else, using energy also sourced from elsewhere. Australia is an old land mass. The funny thing about old land is that they tend to contain gold on or under the surface in various spots. People like gold, heck I could seriously use a chunk or two of gold! So when it was discovered here in this corner of the planet in 1850, people came from all over the world to try their luck on the goldfields and hopefully get rich. Melbourne became the second wealthiest city in the British Empire (after London) for quite a period of time until about the 1890’s and things were rocking along really nicely during that time. It was an amazing achievement given the colony was only founded in 1834. Whilst some people made heaps of mad cash on the goldfields (and some still do today) many more people soon exhausted their resources and had to return to their previous trades. In a weird twist of fate, some of those impoverished gold miners came from Oregon in the US were they’d previously worked as timber getters. 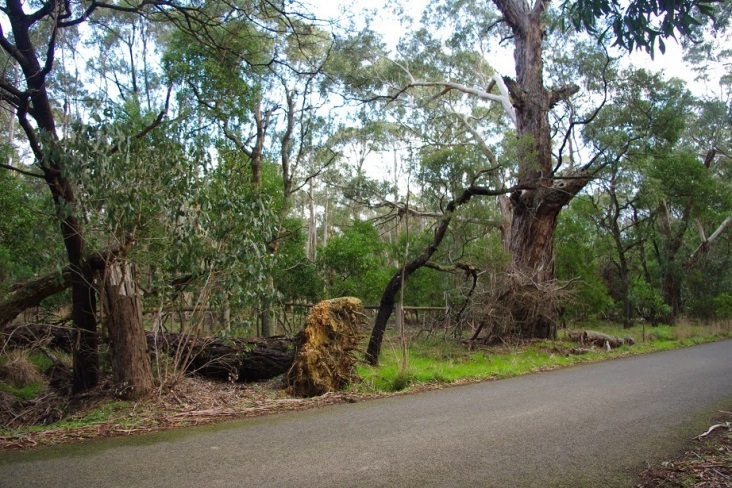 As they passed back to Melbourne from the goldfields, they saw a different form of gold in the Macedon Ranges and adjoining Wombat forest. The gold they saw there were trees. Big trees. Really, really big trees. 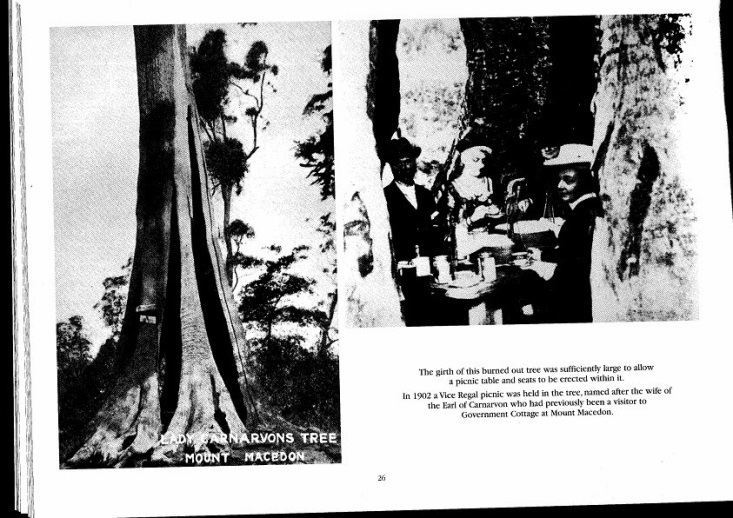 It is no exaggeration to say that they would have been amongst the tallest trees on the planet. It would have been amazing to have seen the forests in those days. So given it was close to a steam train line between the goldfields and Melbourne, those canny Oregon timber getters established timber mills and timber tramways through the forest here and named this side of the mountain range “Cherokee” after the Sioux Indian forests of the US with which they felt there were remarkable similarities. The township was surveyed; a post office and even a primary school were built and occupied. The late Victorian era of the 1890’s even built health resorts high up in the clean mountain air to escape the summer heat and the very real fear of cholera and typhoid. Yet the town was eventually abandoned. By the aftermath of World War II, the history books state that for a decade or so there was only a single person up on this side of the mountain range. It is important to note that the area had been used to grow potatoes and berries for many decades prior to this. The question should be asked in this circumstance is: why was the area abandoned? There are many answers to this question, but the one that strikes me as being the most plausible is after many years of personal experience is: lack of water during summer. Anecdotal evidence from the documented accounts of the early explorers and settlers also indicate that the Aboriginals only inhabited this area during seasons other than summer. The mountain range rises up out of an elevated plain so it is a watershed for the surrounding area. So where did all that rainfall go? The simple answer is that all of that rain didn’t disappear; it just went into the ground water only to turn up elsewhere down below. A lot of people in the US have wells (we call them water bores) to access drinking water. In Australia, these are a problematic system because they have to be drilled very deeply and they are often brackish (i.e. they contain some salt). These two issues alone mean that they are not a popular option because it requires a huge amount of energy to pump the water up from the depths and possibly to also desalinate that water (i.e. remove the salt). A neighbour has a water bore (water well) and he told me that during the drought of 2009, the system was only able to provide water for 7 minutes before running dry. This means that in a boom and bust environment like Australia, the water table can vary greatly in height below the ground. The trees up this way have adapted to those conditions by growing a massive tap root. They don’t have a problem as they rise high above the under story canopy and grow tall and dead straight. They would appear to have access to lots of water all year around. At a lower elevation in the mountain range on a less steep site, the water runs for most of the year above ground. So this tells me that land at higher elevation acts like a sponge, yet land at lower elevation which is also flatter, tends to leak water across the landscape. 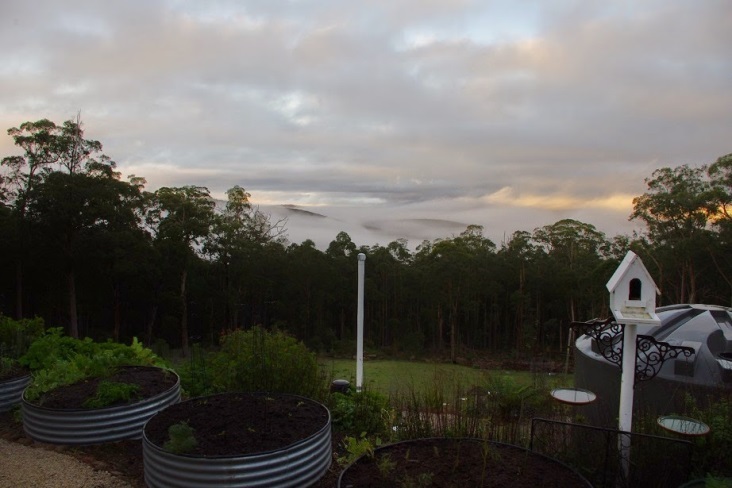 It also means that the trees in this lower, flatter area of the mountain range also don’t need the tap roots required to access water all year round. The reason for this is that there is plenty of water close to the surface, so their root systems can spread outwards rather than downwards. You’d also expect that those trees would be wider and shorter. There is one disadvantage for those trees which don’t have a massive tap root. They tend to fall over in high winds (roots and all). So now, you know these things you can start to look at the vegetation differently in your area and let nature tell you the story about ground water in that location. At the very least it will hopefully save you a lot of digging! Next week, I’ll start to discuss how water is collected at the farm. I’ll leave the story of my friends the magpies and wombats to another week, but will leave you with a photo of the entrance to a wombat home on the farm. July is generally colder than June and right now outside at 9pm it is 5.1 degrees Celsius (41.2 F) and the rainfall for the year has been 474.6mm (18.7 inches) which is up from last weeks total of 440.8mm (17.4 inches).